The Marriott Grand Hotel has offered an attractive conference rate of $179 single/double occupancy. To guarantee accommodations your room reservations must be made prior to Friday, July 26, 2019. After this date, the hotel will honor any request for rooms at the group rate subject to availability. Reservations for this event will be made by individual attendees directly with Marriott reservations at 1 (800) 228-9290 or (251) 928-9201 and ask for Tenn-Tom Waterway block of rooms using code TEN. This code should also be used to make your reservations online at www.marriott.com. All reservations are accepted on a guaranteed basis only. An advanced deposit of your first night room charge is required to confirm this reservation, or a credit card guarantee. All reservations are subject to a 5-day cancellation policy. Any reservations cancelled within the 5 days of arrival will be charged one room night and tax. CHECK IN TIME IS 4:00 P.M. CHECK OUT TIME IS 11:00 A.M. All rooms are non-smoking. The registration fee includes all conference sessions as well as the receptions and most meals. Guest tickets for individual events will be available at the registration desk. Send completed registration form with payment or billing instructions to the Tennessee-Tombigbee Waterway at the address listed on the registration form. A telephone registration may be made by calling (662) 328-3286 or 888-Tenn-Tom; FAX to (662) 328-0363 or email to azaiontz@tenntom.org. Registration will be confirmed promptly upon receipt of the completed registration form. Click here to register online. Cancellations must be received no later than Friday, August 17, 2019 in order to receive a full refund. All registrations must be paid prior to conference. NO REFUNDS WILL BE ISSUED FOR CANCELLATION POSTMARKED OR CALLED IN AFTER THAT DATE. Substitutions may be made at any time. The Golf Tournament will be Thursday, August 29, 2019, at the Lakewood Country Club, Dogwood Course. Cost per player is $100.00 for greens and cart fee. For more information, call Bruce Doughty (662) 574-0735 or Will Sanders (662) 242-2729. 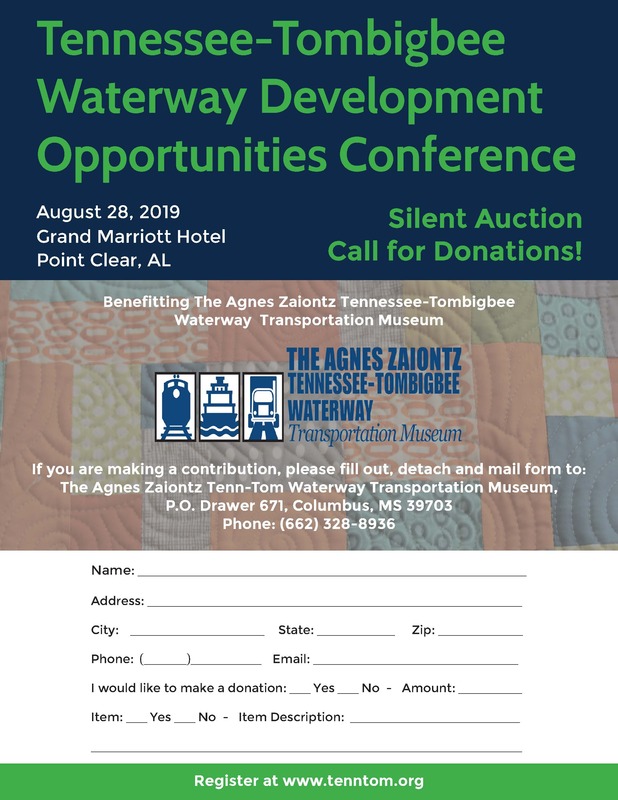 A Silent Auction to benefit The Agnes Zaiontz Tennessee-Tombigbee Waterway Transportation Museum and Intermodal Learning Center will be held on Wednesday, August 28, 2019, in conjunction with the dinner session. If you have items that you can contribute for the auction or for more information contact Agnes Zaiontz at (662) 328-8936 or azaiontz@tenntom.org, or Debbie Fason (205) 399-9899. Commercial printed materials may be displayed near the registration desk as long as space is available. Exhibitors with tabletop or standing displays should contact the Council office for pricing and availability.